Tank's mission is to be the leader in sustainability in the construction, demolition, and landscape waste industry. Tank's demonstrates that it is possible to recycle many materials currently disposed of in urban waste landfills. 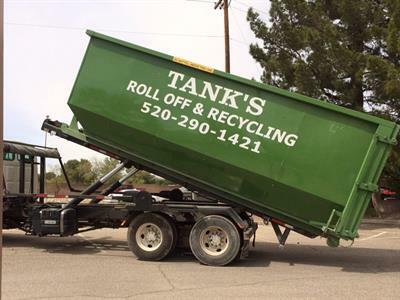 Tank's Roll Off is the sustainable solution for your next construction, renovation, landscaping, or cleanup project. We can deliver 15, 20, 30, or 40-cubic yard roll off containers to your home or job site. You can utilize Tank's Roll-off containers as a collection dumpster for debris, for landscape material delivery, or a combination of both. They are the perfect solution for your next project, small or large. Tank's Roll Off is a division of the Fairfax Companies. The Fairfax Companies accepts construction & demolition debris, inert materials, landscape waste, and recyclable materials. We screen and sort all materials making sure that as much recyclable material as possible is diverted from the landfill. Tank's recycles: Wood, Metal, Plastic, Cardboard, Green Landscape Waste, Concrete & Block, Styrofoam and more. We are located on Prudence Street, just north of Speewday Boulevard.